Cuisinart Electric Wine Opener Just $16.54! Down From $55! You are here: Home / Great Deals / Amazon Deals / Cuisinart Electric Wine Opener Just $16.54! Down From $55! Amazon has this Cuisinart Electric Wine Opener for just $16.54 down from $55 PLUS FREE shipping with Amazon Prime or for orders $25 or more! The Cuisinart Electric Wine Opener uncorks up to 50 bottles on one charge, and recharges quickly with a NiMH battery pack and sleek, compact charging base. 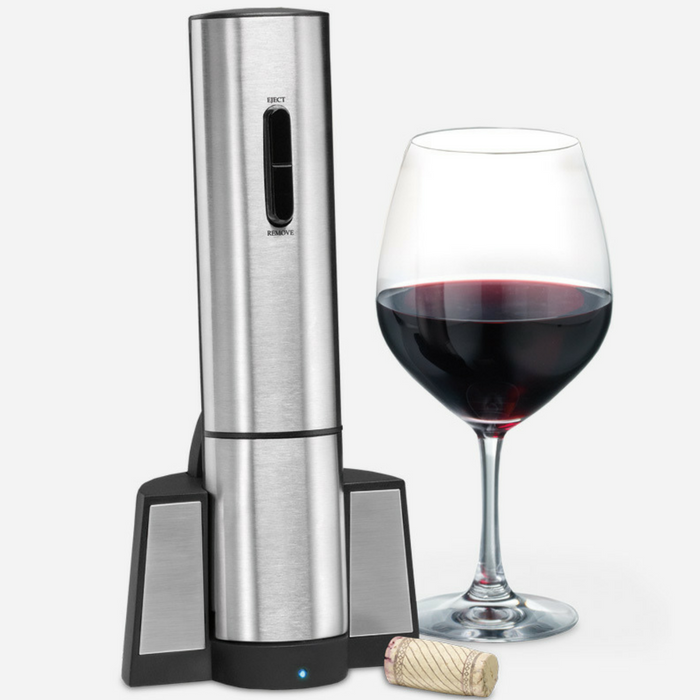 The wine opener powers through synthetic and natural corks without breakage – no more cork floating in the wine glass! With two buttons, it’s easy to operate: Simply press “Remove” to uncork the wine, and “Eject” to release the cork from the screw. Its sleek stainless steel design looks great on a counter or wet bar, and wipes clean easily. A foil cutter ensures clean openings and drip-free pours, and neatly stores inside the charging base when not in use. This is the perfect gift for wine lovers, entertainers, and anyone who appreciates convenience.